T his post was suggested to me by one of my readers, Kenneth Campbell. I'm fudging a bit on the science stuff because even though I took 4 years of biology in high school, I still never managed how to figure out how to turn on the bunsen burner! She was one of the most beautiful and brilliant women of the Enlightenment age, and the lover of Voltaire. 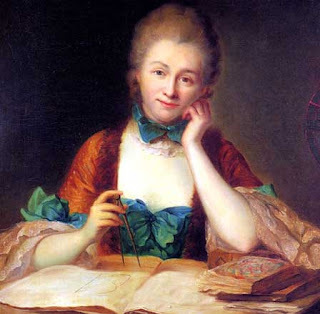 Her name should be on everyone's lips but due to the erasing of most women from history, Emilie du Chatelet is not as well known as she should be. Born in December of 1706 to a well-to-do family, Emilie was encouraged in her studies by her father. Louis Nicolas le Tonnelier de Breteuil was the Principal Secretary and Introducer of Ambassadors to Louis XIV. This gave him access to all the great thinkers of the day who came to court. Emilie's father would bring them home to meet Emilie like Fontenelle, who was the perpetual secretary of the Academie de Sciences. They talked astronomy together when Emilie was ten years old. Despite the fact that most girls of her class were barely educated, many couldn't write their own names, Emilie had a classical education, much to the disgust of her mother who only cared about Emilie making a brilliant marriage. Her father also arranged for her to having fencing and riding lessons, she learned Latin, Italian, Greek, and German. When the family fell on hard times, Emilie used her mathematical skills to win at gambling. The money she won, she used to buy books, instead of dresses and fripperies. At the age of 18, she played the dutiful daughter and married the Marquis Florent-Claude du Chastellet (it was Voltaire who introduced the spelling Chatelet), becoming a Marquise. Out of all of her suitors, the Marquis was the only one that Emilie felt she could tolerate. The Marquis promised not to interfere with her studies, and Emilie turned a blind eye to his infidelities. After bearing three children, Emilie was bored out of her mind. She moved to Paris where she hoped that she would be able to find some way to pursue her studies further. Her husband didn't mind because he felt that a pied a terre would be good to have in the capital. Emilie soon found herself involved in a love affair with the duc de Richelieu, great grand nephew of Cardinal Richelieu. The duc was rich, powerful, and extremely handsome, men wanted to be him, and women threw themselves at his feet, begging him to make love to them. Emilie was a different kettle of fish. He fell for her because he liked to talk to her. She was witty and talked a mile a minute about the things she loved, which was mainly science and the theories of John Locke. The affair didn't last long, the duc couldn't be faithful to anyone, and the very thing that made Emilie different began to pall after awhile. Still they managed to end their affair with dignity and remain friends. Now that Emilie had discovered sexual satisfaction, she yearned for a man who could satisfy her both intellectually and sexually. She found in him Voltaire. Born Francois Marie Arouet in 1694, he had just returned from a long exile in England. His father had been a lawyer and notary who despired of his youngest son. He took the name Voltaire during his first sojourn in the Bastille. Since his father thought so little of him, why should he keep his name? Emilie and Voltaire were introduced by mutual friends in 1733. Emilie was 26 and Voltaire was thirty-eight. Already he was famous for his plays and poems and his ability to get into trouble. His English exile had come about because he insulted the nephew of Cardinal de Rohan, how had Voltaire beaten up for his pains. When Voltaire protested, his aristocratic friends turned their back on him and he was jailed. Given the choice of another sojourn in the Bastille, Voltaire chose exile in England. I found only the shadow of our pleasure. Emilie and Voltaire were immediately attracted to each other and became lovers soon after they met. They were so hot for each other that they broke the conventional rules of adultery, showing their affection in public, romping indiscreetly all over the countryside. Voltaire had finally found a woman who was intellectually his equal, although his superior in rank. Emilie finally had a man who respected her brain as well as her body. In Voltaire's case, he had finally met a woman who respected and adored him. He taught her how to speak English so that they could converse without anyone understanding what they were talking about. She read his work and gave him gentle criticisms. Voltaire had managed to make a fortune by manipulating the French lottery, which impressed Emilie. Although they were in love, the relationship had its ups and downs. Voltaire was a terrible hypochondriac, and Emilie, although she tried, had little patience when he fell ill. They broke up briefly and Emilie plunged into an affair on the rebound with Moreau de Maupertuis, an explorer and scientist. Although intellectually they were compatible, she didn't love him the way she loved Voltaire. He also tended to treat her more like a mistress and less like a fellow scientist. She missed Voltaire and they soon became lovers again. They even found a project that they could work on together, a wife for their mutual friend, the duc de Richelieu. Soon after they moved into the Chateau Cirey, a tumble down chateau owned by Emilie's husband in the country between Champagne and Lorraine where they would spend the next ten years on and off. The move was precipitated by Voltaire who had gotten into trouble again. His book Letters from England had been censored, but the printer, looking to make a quick buck had printed it anyway and was selling copies. Voltaire escaped the arrest warrant by fleeing to the duc de Richelieu's camp, where he lived among the soldiers for a few weeks, instead of fleeing to Switzerland or the low countries. When Emilie found out that he had moved into the Chateau and had started renovations, she was pissed. It caused yet another rift which was soon healed when Emilie again realized that Voltaire was the only man for her. They discovered that they were both enamored of Newton and decided to work together to further interest in the late scientist. They also worked together on a study of the Bible as well. They also liked to put on plays in the Chateau's little theater, where Emilie would also entertain by singing. Voltaire's interest in science was sparked by his lover, he decided to enter a contest dealing with experiments with light and fire. Emilie too entered the contest anonymously. Neither won, but Voltaire soon realized that Emilie's mind was quicker than his. She managed to best his work even though she didn't have the expensive equipment that he was using. He quickly realized that the only reason that she had been ranked lower than him in the results was because she was a woman. His pride was pricked although he refused to admit it. Soon, Emilie and Voltaire were hanging out with some of the best minds in France, and Emilie soon began a correspondance with other scientists. Her work was beginning to be recognized and her intellect approved of by more than just Voltaire. Their idyll was also interrupted by Voltaire's inability to hold his tongue. He'd already gotten into trouble once during the duc de Richelieu's wedding when he ended up fighting a duel with the bride's cousin and killing him. Their relationship also ruffled feathers at court. Versailles ran by making it the center of life for the nobility, for Emilie and Voltaire to be happy in the country meant that other aristocrats might get the same notion in their heads and realize that Versailles was not the center of the world after all. They were saved by the fact that Emilie's husband and Voltaire became good friends. Emilie was also involved in a court case involving her newly discovered half-sister, and the cousin who was upset at having to share the family wealth. She had also moved on from Newton to his great rival Gottfried Leibniz and his theories. They were starting to grow apart with their now seperate interests. Voltaire had given up science for history, planning a biography of Louis XIV that was not flattering to the Sun King. There was also the problem of Frederick the Great of Prussia. Voltaire had been corresponding with the new monarch since he was still the crown prince. Now that he was King, Voltaire was hoping to put his Newtonian principles into practice by advising the new King. He used Emilie's contacts at court to be sent as a sort of spy for the French government to the Prussian court. Emilie tried to convince him not to go but his pride demanded it. In Prussia, he found a King who on the surface seemed indolent but it was only a ruse, Frederick had great plans involving his army. Voltaire was just a prize to be won. The long seperations from Emilie began to take its toll on the realtionship. Puffed by the King's flattery, Voltaire became indiscreet in his letters, criticizing not only the French government but also Emilie. All his resentment towards her came out in his letters, but what Voltaire didn't know was that his letters were not private. Frederick had been sharing them with others and the news got back to Emilie about what her lover was saying about her. The two lovers split once again. Voltaire tried to salvage his reputation by becoming a courtier at Versailles, the very thing that he had never wanted to become. Emilie was appalled and distraught over the end of their relationship. She gave up her work and spent more time gambling, but her old skill had left her and she ended up in debt. When she wrote to Voltaire for help, he made her wait until the last possible minute before paying the debts. Voltaire and the duc de Richelieu saw a chance to curry favor with the King when his latest mistress died. They found Jeanne de Poisson, the daughter of a fishmonger, and introduced her to the King, figuring she'd be grateful to them. However, Jeanne was much smarter than they gave her credit for, as the King became more enamored and heaped money and titles such as Madame de Pompadour on her, the more independent she became. He'd also become involved in an unsatisfying affair with his widowed niece. Soon Emilie and Voltaire realized that they needed each other. Their sexual relationship was over, there was too much water under the bridge for that, but their friendship and love still remained. Soon they were back living at Cirey again and working. Emilie was working on a book that would be called Institutions de Physique (“Lessons in Physics”) a review of new ideas in science and philosophy but it incorporated and sought to reconcile complex ideas from the leading thinkers of the time including Leibniz and Newton. She also began a translation into French of Newton's Principles of Mathematics. Emilie fell in love in her early 40s with the poet Jean François de Saint-Lambert, who was ten years younger than her. The love affair was fraught, Saint-Lambert had been the lover of marquise de Boufflers, the mistress of King Stanislaus of Poland, father-in-law of Louis XV. Emilie had thought that affair was over but she soon discovered that it wasn't. Still she couldn't give him up and she became pregnant. When Voltaire discovered the relationship, he was jealous, despite the fact that he and Emilie were no longer lovers themselves. Emilie convinced him that she took a lover because she knew that Voltaire was getting on in years, and needed his health to complete his work, not spending time making love to her. It seemed to appease him. To still the gossip about whose child she was carrying, Emilie's husband came to Cirey for a few weeks, while Voltaire made a hasty exit. In a letter to a friend she confided her fears that, because of her age, she would not survive her confinement. During her pregnancy she moved into Stanislaus's suite at Versaille where she doubled her efforts to finish her book on Newton, staying up until 3 and 4 o'clock in the morning. The relationship with Saint-Lambert ended on a sour note when Emilie told him that she was pregnant. Even before that, there were signs that he was using her for advancement and not for love. He was insecure in his talent, aware that he was no poet like Voltaire. Emilie tried to soothe his ego but he knew that she was not impressed with his writing. Emilie bore the child, but died six days later from an embolism at the age of 42 in September of 1749. The child, a daughter, soon died as well. Voltaire was distraught. "I've lost the half of myself - a soul for which mine was made." Months after her death, his servant Longchamps would find him wandering through the apartments that he had once shared with Emilie in Paris, plaintively calling her name in the dark. Voltaire soon left Paris for Berlin where he was involved in the Academy of Sciences. He helped to prepare Emilie's book for publication. It came out ten years after her death, called The principles of Mathematics and Natural Sciences of Newton," just in time for the return of Halley's comet. Her work contributed to energizing the school of theoretical physics in France. As for Voltaire, he began a long correspondance with Catherine the Great from his villa in Switzerland where he lived after leaving Berlin in 1758. He wrote Candide, which was turned into a Broadway musical in the 1950's. He died in 1778, having outlived Emilie for almost thirty years. What Emilie and Voltaire shared was rare in the 18th century, or any century for that matter. For two people to find each other both sexually, and intellectually compatible, particularly in an era where intelligence in women wasn't exactly a prize, was a miracle. Despite the travails they went through, Emilie and Voltaire still came back to each other in the end. The strength of their feelings for each other outweighed all the hurt and anger. Although Voltaire was a published playwright and writer both before and after his relationship with Emilie, she spurred him onto new heights and to new ideas. As for Emilie, he gave her the courage and confidence to believe in herself and her work. Amazing! History comes alive when we learn the foibles of its makers. This was extremely interesting. Thank you for this post. I had never heard about her in such detail. You have once again brought a hidden piece of history to brilliant light, thanks. On a minor point of grammar, "Emilie tried to soothe his ego but he knew that she was not impressed with his writing Emilie bore the child, but died six days later from an embolism at the age of 42 in September of 1749"
Maybe a full stop after writing and before Emilie? Thanks Dave, that's what happens when you write really fast. I was so sure that I put a period before that sentence but I guess that I didn't. I will make sure to fix that. Thanks, Margaret. That's interesting, considering that Emilie is not that well known and we know that publishers generally like fictional biographies to be about people everyone knows, hence the Tudor explosion of recent years. I look forward to reading it when it comes out. Wonderful post! I am an eternal admirer of Emilie and have written about her in several works. In my latest she's a kind of consultant detective. Called Murder at Cirey, it's out on Amazon in paperback and Kindle. You may enjoy.